Join the #salesdev17 Conference Sept 21st in SF! Sales Bootcamp is proud to be a sponsor of the#SalesDev17 conference on Sept 21st! The Sales Development Conference brings together VPs, Directors and Managers of Sales Development, along with SDRs, Marketers, C-Level Execs, Owners and VC’s for a day of learning and networking 100% focused on Sales Development with the top minds in our industry. The conference will include general session presentations, fireside chats, and panel discussions lead by world-renowned Sales Development experts. Anyone involved in Sales Development will gain tremendous value from attending. 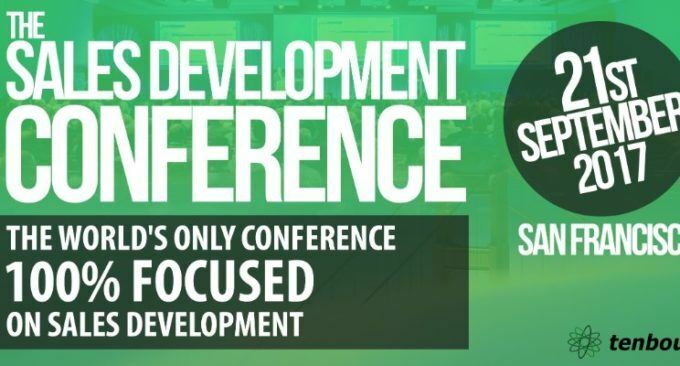 As the only conference dedicated 100% to Sales Development, The Sales Development Conference provides a unique opportunity to learn, grow, connect and move our practice forward. Be part of the movement! Now, go learn the subject, take that knowledge and put it into practice. Become an expert, and go crush it. Be proud to be in Sales Development; go elevate our profession and your career. Let’s carve out the respect we deserve, today.